“Guindon needs help from local anglers who are willing to ‘swab’ a tarpon to acquire its DNA. Her April 19 lecture will include instructions on DNA sampling, as well as some of her preliminary findings about recapture rates and tarpon habits. The presentation, which is free and open to the public, will begin at 7 p.m., before the film is shown.” Mandy Bolen on KeysNews.com. 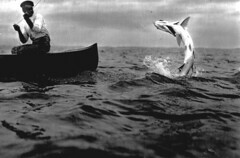 See a clip from “Tarpon” here.